NORTH ATTLEBORO, Mass. – The North Attleboro Red Rocketeers took an early lead in their late-season showdown with King Philip on Tuesday afternoon and were able to fight off a second-half comeback effort from to Warriors to win 11-9. 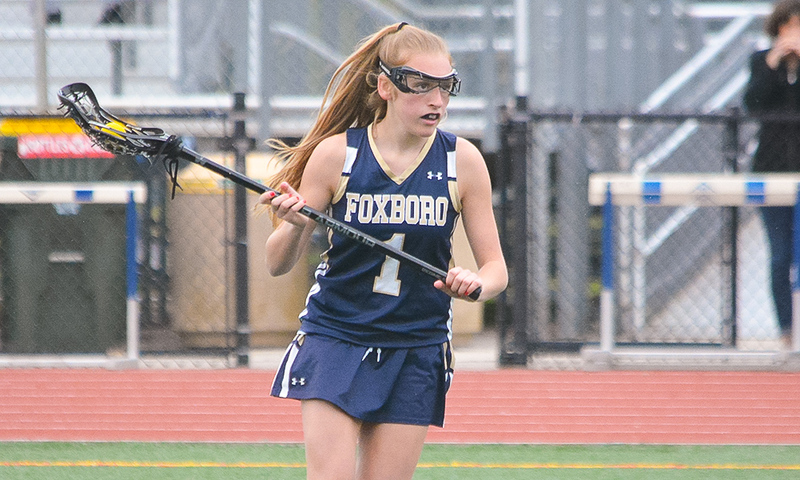 Senior attacker Camille Pizzaro led the Rocketeer offense with four goals, while senior midfielder Julia Dakin had three goals and three assists, and sophomore midfielder Katie Lindstrom had two goals and four assists. 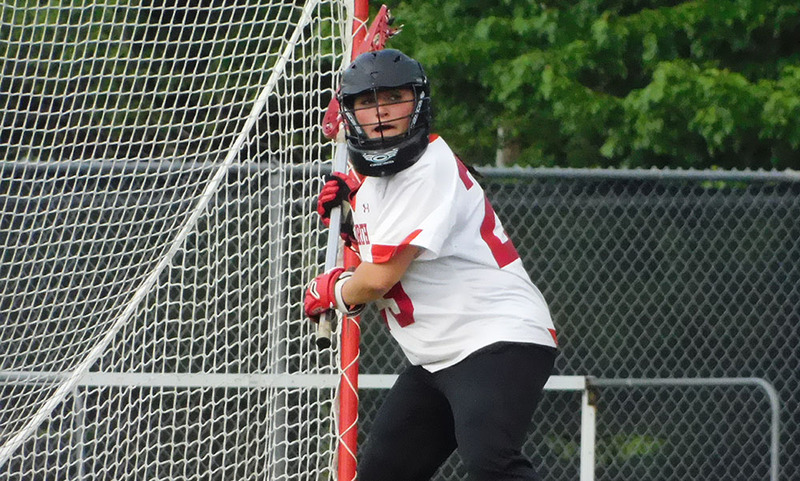 In the net, senior goalie Kayla Moulin made nine saves for North Attleboro. 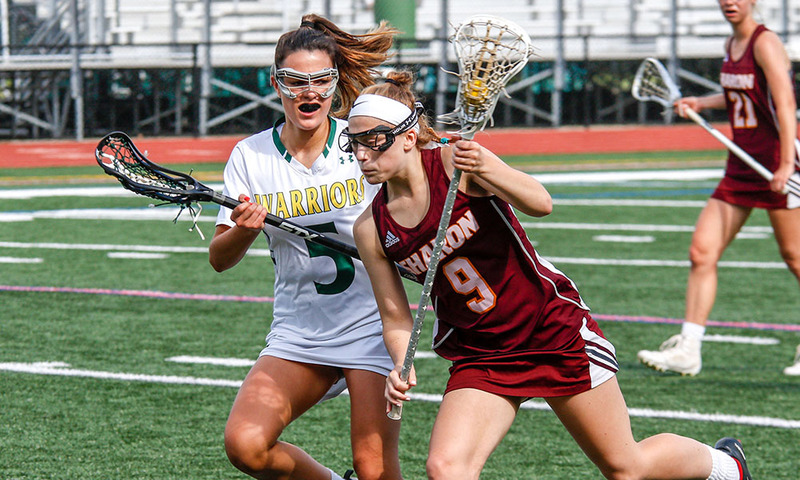 On the Warrior side, junior Caroline Klim had four goals while fellow juniors Olivia Tormey and Alli Meehan both had a pair of goals each. The Warriors found the back of the net first within the first minute of the game as Meehan scored from a free position 51 seconds after the first draw to give the visitors the early lead. Pizarro struck back less than a minute later, as the senior bounced a shot past junior goalie Caroline Watson to draw even. Pizarro struck again with 16:54 remaining in the half off a free position to give the Red Rocketeers their first lead of the afternoon. Exactly three minutes later, senior midfielder Julia Dakin scored on a low shot in front of the net to extend North’s lead to 3-1, and senior midfielder Julia Tolfa turned and put a shot past the goalie with 9:35 left in the half to make it 4-1. The North defense kept King Philip in check for much of the first half, with the defenders keeping the Warrior attack from reaching Moulin in most cases. King Philip thought they had split the lead in half with 3:26 left in the half but an illegal stick call took the goal off the board. Sophomore defender Regan Fein and Lindstrom added a fifth and sixth goal to the home team’s total at the 3:00 and 1:44 marks respectively. At the 1:33 mark, however, momentum began to shift as Klim scored from a free position to make it 6-2, the first of three straight Warrior goals to finish the half as juniors Olivia Tormey and Victoria Tormey both beat out Moulin and the trailed the hosts by just two goals going into the second half. When the action resumed, it seemed much of the same as Klim added another goal with 23:39 left to make it 6-5. Just 25 seconds later though, Pizzaro struck again and extended the Rocketeer lead to two goals again. Lindstrom added another as she ran down field and delivered a goal with 22:09 remaining to make it 8-5. The game would stay fairly even for much of the next few minutes until Klim put a quick low shot in the bottom right corner of the net with 15:49 remaining, followed by another strong shot from the UMass Lowell commit with 15:14 remaining to make it 8-7. From there, the Warriors staged a comeback effort. Meehan tied the game up at 8-8 off a free position with 13:07 remaining, while Olivia Tormey put King Philip in front for the first time since the opening minutes with 12:35 remaining. Lindstrom drew North back even on a free position with 11:01 remaining, 9-9. From there, North would threaten with a couple chances retook the lead when Dakin went behind the goal and turned left to put it in with 7:29 remaining. North retained control of the game, capitalizing on dropped balls by King Philip and being quick to fix their own mistakes. Pizzaro added a final goal with 1:09 left and the Rocketeers were able to close out the win at home. North Attleboro (6-4 Hockomock, 7-10 overall) returns to action Thursday as they host Walpole in their final regular season game, while King Philip (7-3 Hockomock, 13-5 overall) regular season came to a close, and now the Warriors will wait on their seeding and opponent for the first round of the tournament.